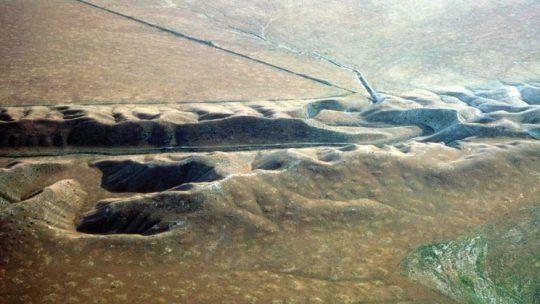 California's San Andreas Fault is definitely moving. Could an earthquake be next? Scientists have detected definitive movement around the San Andreas Fault system in California. Areas of land surrounding the fault have been shown to be rising and sinking, according to findings reported by the University of Hawaii. The scientists found that the Los Angeles Basin, Orange County, San Diego County and the Bakersfield area are sinking 2 to 3 millimeters a year. Inversely, Santa Barbara County, San Luis Obispo County, and a large portion of San Bernardino County — an area about 125 miles wide — are rising. According the Los Angeles Times, this range of motion is comparable to the combined widths of several coins. Scientists and researchers have suspected this kind of tectonic motion for years but have never had the means to monitor it before. “While the San Andreas GPS data has been publicly available for more than a decade, the vertical component of the measurements had largely been ignored in tectonic investigations because of difficulties in interpreting the noisy data,” Samuel Howell, lead author on the study and a PhD candidate at the University of Hawaii, said in a statement. “Using this technique, we were able to break down the noisy signals to isolate a simple vertical motion pattern that curiously straddled the San Andreas Fault,” he added. The capability to measure this kind of motion is groundbreaking and crucial to public safety. This tectonic motion and subsequent stress has the potential to unleash a potentially catastrophic 7.0 magnitude earthquake. However, experts don’t know when this next wave will hit. “It’s pretty much impossible to say when the next one will happen,” Howell told the Los Angeles Times. The state of California lies at the intersection of two tectonic plates, which puts it at a higher risk of earthquake activity. There are dozens of fault lines separating the two plates throughout the state and the San Andreas Fault is one of the most significant. The fault line has been behind some of the most devastating earthquakes in the state. In 1906, a quake hit San Francisco, causing widespread damage to the city and killing at least 700 people. In 1989, the 6.9 magnitude Loma Prieta earthquake also struck the Bay Area, a product of the northeast span of the San Andreas Fault. The shockwaves caused upwards of $5 billion dollars in damage and collapsed portions of the Oakland Bay Bridge. But the southern portion of the San Andreas has been quiet for a longer timespan. Records show that Southern California gets hit by a large earthquake every century or so. The last major seismic activity in the region was a 7.9 magnitude earthquake in 1857, which hit Fort Tejon and could be felt as far away as Las Vegas, 300 miles away.